ST JOSEPH'S Day is an important annual event on the school calendar and was celebrated by students of StJoseph's School on Tuesday, March 19. Beginning with a liturgy in the Bathersby Centre, students were then invited to a barbecue sausage sizzle lunch. Following lunch, students buddied up for an afternoon of fun activities including dodge ball, limbo, tug of war, rob the nest and dance fit. Thank you to the senior students who co-ordinated the activities and to the teachers who helped to make the afternoon an enjoyable occasion. Years 5-6 spent three days at Camp Laurence, Lake Moogerah, where they enjoyed a canoe trip around the lake to the gorge, a mountain-bike ride around the camp, high ropes and some team challenges. Year 7 students spent three days at Burleigh Heads involved in teamwork activities, including bouldering, high/low ropes, canoeing, mini golf, team initiatives, swimming, body boarding and surf awareness. 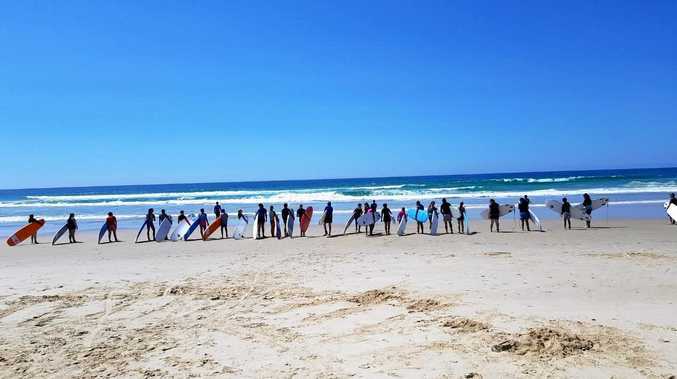 Year 8 students travelled to Camp Drewe at Lennox Head, where they focused ontogetherness and resilience and enjoyed some archery, low ropes, surfing and stand-up paddle boarding. At each of the camps the students were positive and extremely supportive of each other taking on challenges they had never experienced before, with much enthusiasm. After three days of exercise, teamwork and fun, students returned with friendship bonds strengthened and a few sore muscles.